That attitude, though—that you could do anything you liked just so long as you learned a few basic rules and concepts—wasn’t just limited, in those early days, to the hardware. Apple started bundling a little app called HyperCard with the Macs it sold in 1987, and with HyperCard, if you could think of an app, you could build it. Apple has moved away from the homebrew mindset, making computers for the desktop, laptop, and pocket that are hugely powerful but which trade the Wild West attitude of the ’80s for stability and a very different kind of creativity. For Mac users of a certain vintage, though, HyperCard still looms large in the mind. 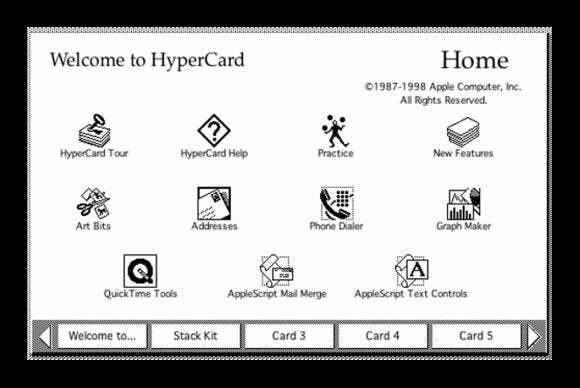 When we asked on Twitter what your memories of HyperCard were and why you thought it was important, one of the most common replies we got was from app-makers today who said that they might never have become developers in the first place if it wasn’t for HyperCard. @chrisphin @macworld HyperCard got me into programming, without it there might not be a @realmacsoftware today! @chrisphin @macworld Using HyperCard in jr. high was my first experience using code to control a computer. So fun I made a career of it. @chrisphin @macworld HyperCard got me interested in programming. One of the older students actually made a very basic FPS it was brilliant. @chrisphin my first unfinished project, a choose your own adventure toon was a HyperCard stack. First of many unfinished projects. @chrisphin @macworld HyperCard was important to me because it allowed me to transform from monomedia artist to multimedia developer. @chrisphin @macworld I built interactive video walls based on laser disc players controlled by HyperCard in a 512k Macintosh. @chrisphin The only time I'd really been able to program my Mac, Hypercard offered so many possibilities. Still wish they'd bring it back. @chrisphin The grand irony being I never actually used Hypercard in the end! Share your memories of HyperCard in the comments, or if you’re too young to have used it, let us know what other creative tools have inspired you!